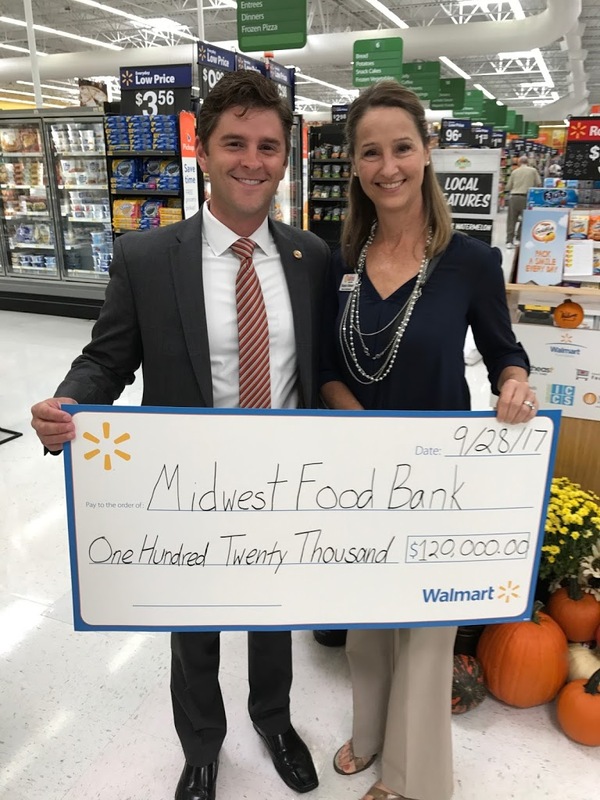 In recognition of September as Hunger Action Month, the Walmart Foundation celebrated the donation of $301,000 in grants to five hunger relief organizations from across Central Illinois at a check presentation ceremony this afternoon. The grant to the Midwest Food Bank will be used to purchase an additional semi-tractor that delivers food products to facilities from all across the country. The grant will provide sustenance for over 500,000 people in need and help over 300 feeding programs serve communities across Illinois, including community health practitioners who help address hunger. The Northeast Community Fund will use the grant to purchase a new 12-foot refrigerated truck that will allow the organization to gather and safely transport food donations from a larger radius. The grant to Eastern Illinois Foodbank will help fund infrastructure investments in the equipment necessary to handle perishable products at EIF partner agencies, such as coolers and freezers for transporting, storing and distributing food; thermometers and temperature calibration devices; shelving units, carts and more. These investments will help EIF’s partner agencies secure and distribute more nutritious food to families in need. The grant to Sarah Bush Lincoln Health Center will allow the Peace Meal senior nutrition program to replace the cooler-freezer at its Rantoul kitchen, which provides 55,400 meals annually to communities across Champaign, Ford and McLean Counties. The ability to maintain safe food temperatures at the central kitchen is critical for program operation. About Philanthropy at Walmart By using our strengths to help others, Walmart and the Walmart Foundation create opportunities for people to live better every day. Walmart has stores in 28 countries, employing more than 2.3 million associates and doing business with thousands of suppliers who, in turn, employ millions of people. Through our philanthropy, Walmart and the Walmart Foundation are helping people live better by accelerating upward job mobility and economic development for the retail workforce; addressing hunger and making healthier, more sustainably-grown food a reality; and building strong communities where we operate and inspiring our associates to give back. Whether it is helping to lead the fight against hunger in the United States with $2 billion in cash and in-kind donations or supporting Women’s Economic Empowerment through a series of grants totaling $10 million to the Women in Factories training program in Bangladesh, China, India and Central America, Walmart and the Walmart Foundation are not only working to tackle key social issues, we are also collaborating with others to inspire solutions for long-lasting systemic change. To learn more about Walmart’s giving, visit foundation.walmart.com.